Attorneys, paralegals, consultants, experts, and clients need not be sitting in the actual room any longer to participate in the deposition and/or arbitration. With the advent of Internet live text, audio and video streaming, they can now be scattered across the country in different locations participating remotely in the proceeding via a secure, encrypted connection from their home office, without incurring the time and expense of travel. An expert witness can be testifying in New York while an attorney in Los Angeles receives the text/testimony, audio and video feed in real time. Broadcast depositions to your team in real time. 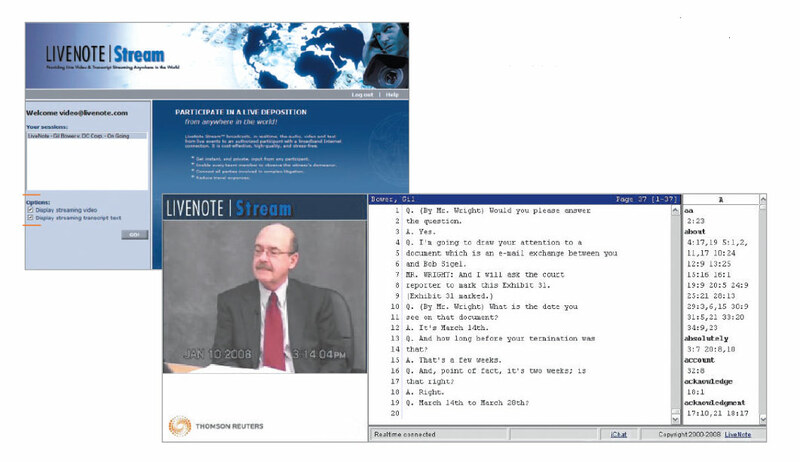 LiveNote Stream lets you broadcast the audio, video, and text of a deposition securely and in real time to all members of your litigation team anywhere in the world where there is Internet access. Remote team members see and hear the deposition so they can pick up on important non-verbal cues that wouldn’t show up in a written transcript. All you need are broadband Internet and Microsoft® Internet Explorer®. Free viewing software is available if you don’t have LiveNote or Case Notebook software.